Underdeveloped websites account for a huge part of the Internet, and a large majority of potential customers encounter these types of sites every day. If your ads aren't on these properties, then you're missing out on valuable traffic! Let DittoDomains help you put your brand in front of a wider audience. Call us today! DittoDomains makes use of an advanced Contextual algorithm. Together with proven marketing techniques, DittoDomains is able to determine exactly where to display your ads. 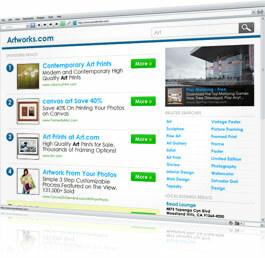 We make sure that your ads only appear on pages related to what users are searching for. Moreover, we have a tight tracking system that catches fraudulent clicks, ensuring that you don't blow your budget on useless traffic. Dormant and inactive domains are very common, and everyone comes across these pages at one time or another. Why limit yourself to the active web, when there are so much more potential customers out there? Let DittoDomains ensure that your ads are displayed on every possible angle on the web.